Descriptions and photographs of these architectural treasures are grouped by geographic districts. 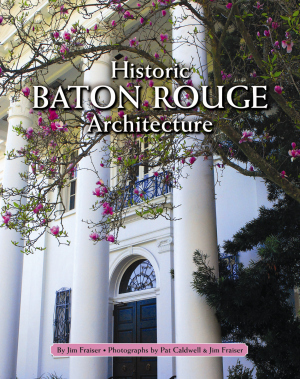 In East Baton Rouge, the Rabalais House, a five-bay, double-galley structure, is featured. Also included is the 1908 Queen Anne Revival-style Reymond House, which has been painstakingly returned to its former glory and added to the National Register of Historic Places. Photographic emphasis on details such as the crenellated and louvered belfry and pointed lancet windows of Baker Presbyterian Church provide an intimate view of these historic sites. Jim Fraiser is the author of fifteen books about the history, architecture, and culture of the Deep South, including the Majesty Series, Mississippi River Country Tales: A Celebration of 500 Years of Deep South History, and Vanished Mississippi Gulf Coast, all published by Pelican. He is a federal administrative law judge, adjunct law professor, and regular contributing book reviewer to numerous regional publications. He resides in Madison, Mississippi.